Healthy Breakfast - Royal breakfast? Someone once said that we should, “Eat breakfast like a king, lunch like a prince and supper like a pauper.” I'm not sure that any of us should ever eat like some kings did, (a corpulent and gout-plagued Henry VIII comes to mind) but this quote generally refers to the relative amount of food we eat at each meal, and not necessarily the type or quality of the fare. Unfortunately for many of us, this order is reversed, as we consume our largest or “kingly” meal at the end of the day, while breakfast, if eaten at all, is often the smallest and poorest quality meal of the day. Note: There is an approach that I have read about (Maimonides and Metabolism) that involves waiting for a few hours after waking to eat breakfast, so that your hormones are at a better level to handle the influx of insulin that will happen when you eat. This does not mean skipping breakfast, but merely, delaying it. An acquaintance of mine has been doing this and finds himself in a better mood in the morning and has lost several inches of belly fat. It is not for everyone, but something interesting to consider. There are probably at least five different breakfast personalities to be found in the general population. These include the Abstainers, the Quaffers, the Continentals, the Misguided and the Savvy. The first group is composed of those who simply skip breakfast. They are either too busy, not hungry in the morning, on a diet, or for whatever reason, just don’t eat until lunch or dinner. If you fall into this category, what you may not realize is that you are putting yourself at a disadvantage when you don’t break your fast and give your body the nutrients it needs to function well. I doubt you would try to drive to work without gas in your car, but you are expecting your body to run on empty. Contrary to what you might think, abstaining from a healthy breakfast may actually hinder your attempts to lose weight, since your metabolism will slow down, to compensate for the lack of calories. In addition, you may find yourself consuming more food later in the day than you would have if you had eaten breakfast. I remember my mom telling me that when she was a teenager in the 1940’s, she and her girlfriends would drink black coffee for breakfast because they were watching their weight. The black coffee, while not having any calories, provided a form of “energy” to get them through the morning. Of course it was a false sort of energy that caffeine provides with none of the vital nutrients a teenager needs in abundance at that stage of life. She and her friends were part of the group I call the Quaffers. With the advent of drive-up windows and coffee shops, the habit of relying on a liquid breakfast has become even more prevalent. Many people, as part of their daily routine, stop at the drive-up window to get their morning “cup-a-Joe,” which may be anything from black coffee to a triple fudge mocha latte. Each of these liquid breakfasts has its obvious limitations in terms of providing a healthy start to your day. Even if you are not a teenager, quaffing coffee in place of breakfast is not the best plan. While it may give you the caffeine jolt you are looking for, it is not enough to nourish your body through your morning’s activities. However, you don’t have to be staying at a hotel to consume this type of breakfast and be part of what I have called the Continentals group. You may be one of those people who eat a doughnut, a sweet roll or even a granola bar washed down with coffee or juice and call it breakfast. In fact, quite often at “breakfast meetings” in a business environment, these are the foods on offer. The problem with this type of breakfast, especially on a regular basis, is that it is generally high in sugar and has little or no protein, fiber or other nutrients to commend it. If you eat this way, you may find that a few hours later, your blood sugar will drop and you will feel sluggish and suffer from brain fog. If a 5,000+ calorie breakfast of mostly refined carbs and saturated fat is your idea of a good breakfast, then you are probably in the Misguided group. You have figured out that breakfast is good for you, but not what qualifies as a good breakfast. Eating this way on a regular basis could lead to all kinds of health problems including obesity, heart disease and diabetes. I have designated the last breakfast personality as the Savvy. This group is made up of people who have discovered the importance of eating breakfast and have the savvy to choose a healthy one. In order to make a healthy breakfast part of their daily routine, this group has come up with strategies that work for them. They make time for a healthy breakfast a priority, even if it means getting to bed a little earlier in order to get up earlier. They include a balance of protein, carbs and healthy fats when they choose breakfast foods, and they know which foods are significant sources of each of these nutrients. 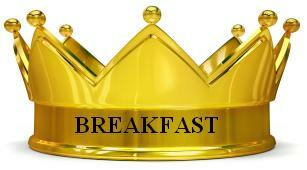 They have done their research and know the menu items that are the best choices if they have to eat breakfast out. There are as many variations of a healthy breakfast as there are tastes and preferences in the world. The breakfasts you choose will depend on what you like, how much time you have to prepare it, and your access to the food supply based on your food budget and where you live. I find that during the week when time is limited, I will choose a simpler meal and then on the weekend, breakfast is a more elaborate meal. --Homemade granola with milk/yogurt and fruit Click here for homemade granola recipe. The answer is simple. If you don’t like breakfast food, then don’t eat breakfast food! There is no law that says you can’t eat chili for breakfast or a casserole or any other food that is not normally eaten at breakfast. The important thing is that you eat breakfast and that you choose healthy foods with a balance of protein, carbs and good fats. Which breakfast personality are you? If you fit into one of the first four categories, I hope you will consider making a change. --If you are an Abstainer, you will have to change your thinking and your lifestyle to include time for breakfast. --If you are a Quaffer, you will need to add some healthy foods to that breakfast coffee each day. --If you are a Continental, you will need to broaden your thinking about what qualifies as a healthy breakfast. 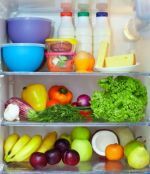 --If you are one of the Misguided, you already have the breakfast habit, and you will just need to modify the amount and type of foods you include. Even small changes in your breakfast habits can make a big difference in how you feel and how well you are. Finally, if you are among the Savvy, keep doing what you're doing and don't forget to share your great healthy breakfast ideas with the rest of us! Click here to go from Healthy Breakfast page to Healthy Menu Plan page.